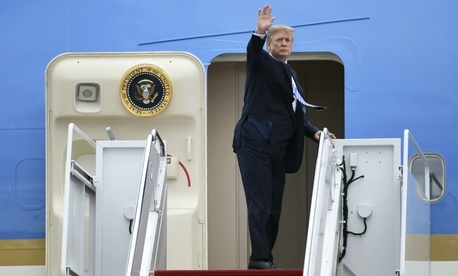 An “informal” $3.9 billion deal for new Air Force One jets — brokered by President Donald Trump and Boeing CEO Dennis Muilenburg — might not be as clear a win for taxpayers as advertised. Although White House spokesman Hogan Gidley touted a “fixed-price” deal on Tuesday, only a “firm, fixed-price” contract would put all potential cost overruns squarely on Boeing. That’s why government officials had been pushing Boeing to sign a firm, fixed-price deal, according to sources with knowledge of the discussions. Without that kind of contract, the Air Force would have to eat at least some of the extra costs if the company fails to deliver the two highly customized planes on budget, according to sources close to the program. But the company’s negotiators balked, bringing talks to a standstill and prompting last week’s White House meeting between Trump and Muilenburg. So just what kind of deal did the president and CEO shake hands on? But throughout the negotiations, Boeing officials have remained adamantly opposed to a firm, fixed-price deal. That reflects recent painful experience — the aerospace firm has eaten more than $2 billion in cost overruns while developing the Air Force’s new refueling tanker — and the expectation that refitting two commercial 747s for presidential service will prove more complicated than hoped. Sources with knowledge of the deal say Muilenburg would not have agreed to one. Meanwhile, White House spokesman Gidley said that the project had been expected to cost more than $5 billion. It is not clear why he said that; previous estimates had been around $4.4 billion, a number that then-President-elect Trump lambasted in December 2016. In any case, he claimed the $3.9 billion handshake deal would save taxpayers $1.4 billion. Sources in Pentagon and industry expect the jets to ultimately cost more than $3.9 billion — and that Trump’s unprecedented involvement will actually save some money. The actual extent of the savings, if any, will remain a mystery until the two planes land at Joint Base Andrews outside Washington some time next decade.